Looking north from the road along the west fork of the Cimarron River. The view goes on forever! This afternoon I headed up and over Owl Creek Pass to visit some friends who are camping on the Middle Fork of the Cimarron River. Along the way I meandered a bit and collected some interesting photos. The one at the top is taken from the road along the West Fork of the Cimarron River. When I came around the corner and saw this I stopped cold, turned off the engine, and just enjoyed the view. I wish you could have been there! Speaking of the west fork, the photo below shows where the road crosses the river. Another mile or so would bring a person to a trailhead that goes into the Wilderness area. But…the runoff has been heavy. You’re looking at a river perhaps 15 feet across and two feet deep, flowing swiftly. Those rocks on the far bank were thrown there during flood phase and present a formidable barrier of their own. Needless to say, I turned around. West Fork of the Cimarron River. That's the ford. No way I'm going through that! The river is running swiftly and is about two feet deep here. Another fascinating thing is shown in the following picture, taken on the Ouray County side looking northwest. What you’re looking at are tall cliffs (1000′). One of the spires has collapsed, creating fresh rockfall. Note the size of the debris field compared to the height of the trees—I’m glad I was nowhere near when it happened! I opted to take a doubletrack trail from Vista Point to Stealey Mountain Trailhead. The trail has been roughed up quite a bit by the heavy snowfall and wet spring and summer, but was traversable. One of the views I love is of Chimney Peak and Courthouse Rock, shown below. Big sky country here in Colorado! Near the center is Chimney Rock and to the right is Courthouse Mountain. I’m not presenting the pictures in any particular order here. This next shot is taken from the bridge over the Middle Fork of the Cimarron River. The rocks around this area are quite dramatic and very tall—those cliffs are at least a thousand feet high. Here's the view from the bridge over the Middle Fork of the Cimarron River. Those cliffs are stunning in the evening light. 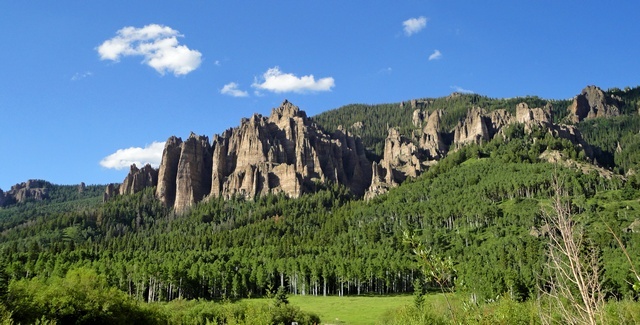 When I came out at Stealey Mountain Trailhead, I met some tourists on high-end dual-sport bikes who had come over Owl Creek Pass and were heading to Ridgway. 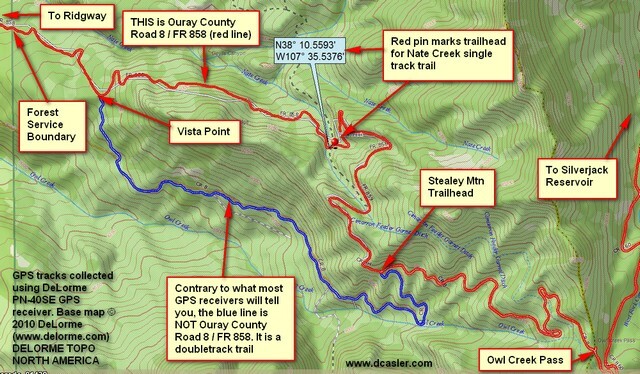 Their GPS told them that Ouray CR 8 (also Forest Road 858) traveled where the blue line is. I assured them that their GPS map was wrong and they were headed in the right direction. In fact, even DeLorme has the route wrong. The blue line is one of several doubletrack trails in the Owl Creek area. Also noted on this map is the location of the Nate Creek Trail trailhead. The rest is self-explanatory. GPS Map covering Ouray CR 8 from the National Forest boundary at the west (top left) to Owl Creek Pass at the east (lower right). The orange is the main road, well-graveled for any vehicle. The blue is a doubletrack trail from Vista Point to Stealey Mountain Trailhead. 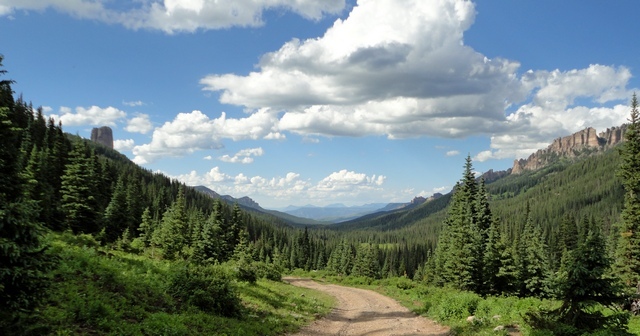 This entry was posted in GPS Tracks, Gunnison County, Motorcycling, Ouray County and tagged cimarron river, nate creek trail, Ouray County Road 8, owl creek pass, Stealey Mountain Trailhead. Bookmark the permalink. I noticed this rockfall in 2011 riding along on Highway 550 on a field trip from Ouray with a Structural Geology class from Mesa State College (now Colorado Mesa University). I pointed it out to my classmates, but nobody seemed very interested. Great bunch of geologists, huh?